When you think of Ringtons, you could be forgiven for not automatically thinking of love hearts, romance and flowers, but you may be surprised to learn that Ringtons has, in fact, played a part in many a great love story in its 108 year history! From couples who met over the tea packing equipment, to the ‘Ringtons men’ who have met the love of their lives on their rounds (we think it’s the basket that does it!) and couples worldwide who’ve chosen to use Ringtons tea and caddies in their wedding celebrations, there’s a feast of romantic stories to choose from. Valentine’s Day might be over but to celebrate all of the lovely ‘Romantic Ringtons’ stories and the coming leap year in which women can traditionally propose, we thought it the perfect excuse to offer up a fantastic one-of-a-kind romantic competition. drink advocates Taste Club and the award-winning Matfen Hall in Northumberland, to offer a very unique prize indeed. 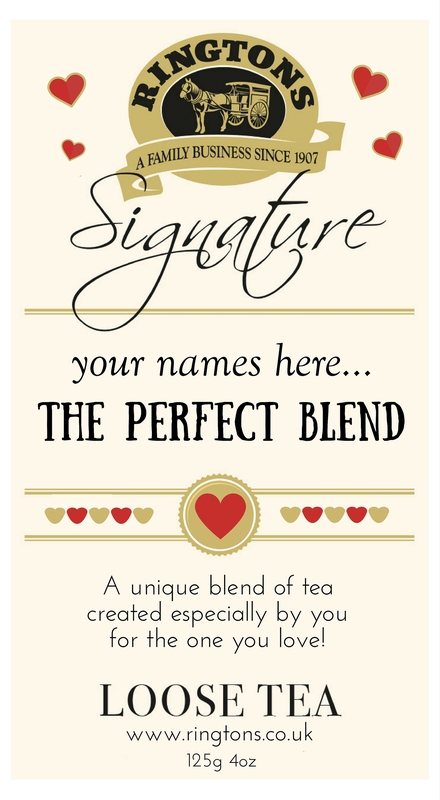 Our bumper prize includes a personalised tea making session at Ringtons head office where our lucky winner will blend their own tea for a loved one with the help of Ringtons very own master tea tasters. The Ringtons team will then help our winner design their very own personal label to add the finishing touches to this very special blend. Ringtons will then also present the finished blend to the lucky recipient! Plus thanks to our partner and Ringtons client Matfen Hall our winner will also be treated to a delicious meal for two and overnight stay at this gorgeous venue. We couldn’t think of a nicer treat! If you think you and your partner make the perfect blend (see what we did there?) and you want to enter our exclusive competition click here to be taken through to our competition entry page. Don’t forget to share the competition with your friends and family – after all they might take you if they win. The competition closes on 4th March and full T&Cs can be found on the Ringtons website. And if you’re still in doubt as to just how romantic Ringtons can be, we’re sure this letter from Theo Watson will change your mind. 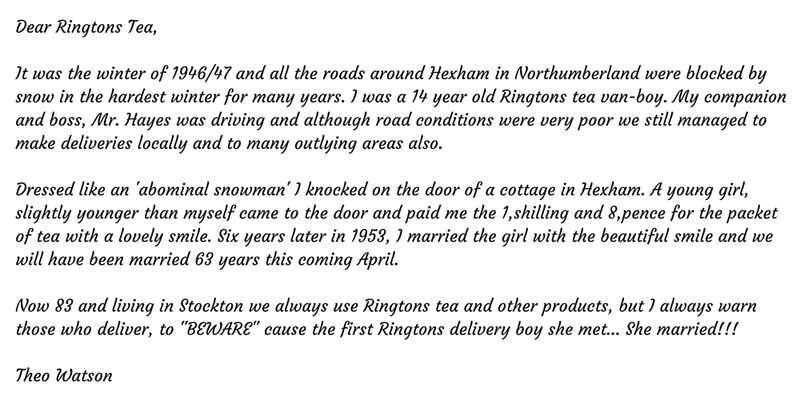 Theo, a former Ringtons van-lad, recently wrote to us ahead of his 63rd wedding anniversary to his wife Pauline to tell us the wonderful story of how the pair first met. We hope you enjoy this letter just as much as we did and join us in wishing Pauline and Theo a very happy 63rd wedding anniversary this April! Pass the Parcel – Win a Luxury Gift Box!